Epi-LASIK and Surface LASIK are different terms for the same procedure. The term “Epi” is the medical term for “surface.” I prefer to use the term “surface” because it is more clearly understood. What is the difference between Surface LASIK and regular LASIK? The difference is what layer of the cornea the laser is applied to. With Surface LASIK the laser is applied to the surface of the permanent layers of the cornea. With regular LASIK the laser is applied to the deeper permanent layers of the cornea. They have the same WaveScan/CustomVue pre-op measuring technique. Both procedures have the same precision in the application of the laser treatment with Iris Registration and 3-D active eye tracking. Once my eyes have fully healed is there any difference in my ability to see? The final outcome of your ability to see between Surface LASIK and regular LASIK is the same. 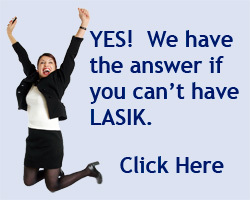 Is there any difference in the possible complications between Surface LASIK and regular LASIK? Luckily, either type of LASIK is very safe and rare to have a complication. Regular LASIK requires making a cut into the cornea to make of flap. Generally, any complication with LASIK is related to the flap. Surface LASIK avoids any of these complications. How soon after my procedure will I have drivable vision? With regular LASIK the return to normal activates is very rapid. Most patients can drive a car the next day. With Surface LASIK the surface needs to heal and it usually takes 4 to 5 days before driving is comfortable. What is the difference in dryness between Surface and regular LASIK? Regular LASIK usually causes dryness and requires the use of moisturizing drops for a month or two. Most patients do not have any long-term dryness. Surface LASIK does not cause any dry eyes after 1 or 2 weeks. What types of patients usually have Surface LASIK? Some eye conditions require us to do Surface LASIK. For example, thin corneas, dry eyes, and strong prescriptions. Patients who want to maximize the safety and avoid any additional risks of LASIK are good candidates for Surface LASIK. It also requires a patient being willing to wait for a few days while their eyes heal to return to normal activities. No, the procedure is painless. For the first few days the eyes feel scratchy. Usually, no pain medicines are needed. Why would I choose Surface LASIK over regular LASIK? 1. Some eye conditions require you having Surface LASIK. 2. You want to maximize the safety while having your vision corrected. 3. Minimize any long-term complications. 4. You are willing to have a few blurry vision days at first while your eye heals.